The exploration of family and for this section, Disney titles, continues with this next recommendation from the Great Movies – 100 Years of Film book following my screening of Snow White and the Seven Dwarf. This time around, there are more iconic moments on display as dogs take to the screen in this eternally popular animated tale, Lady and the Tramp. 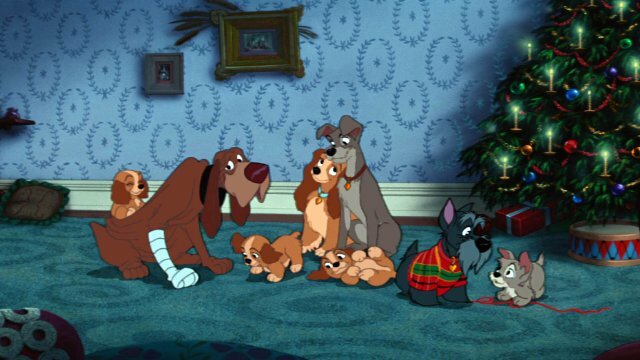 Darling (Peggy Lee) and Jim Dear (Lee Millar) are a young couple, who one holiday season bring a young cocker spaniel pup into their lives, Lady (also voiced by Lee) begins a life filled with love and comfort in the big house she shares with her family. She’s well looked after, part of the family, and has a licence. Her free time is spent socializing with a couple of the local, also licensed, neighborhood dogs, Jock (Bill Thompson), a Scot terrier, and an elderly blood hound, Trusty (Bill Baucom), who may have lost his sense of smell with his age. As Lady tries to figure out what this means for her, along comes Tramp (Larry Roberts), a mutt on the run from the dog catcher, with no licence and no family of his own. She hopes for things to get better, but when Aunt Sarah (Verna Felton) arrives, with her two Siamese cats in tow to give Darling and Jim a couple of days off, the odds are against her, and she flees. During her escape, she meets up with Tramp, who shows her how the other half lives, and in his way attempts to woo her. Unfortunately, not everything is good in this life-changing night, but it does lead to an exciting climax that sees Tramp saving the baby from one of the most truly evil-looking rats that have ever graced the screen. Sarah though thinks Tramp is responsible and catches him and wants him taken to the pound immediately to be put down. It’s up to Lady, Jock and Trusty to save Tramp, and give him a happily ever after with his canine love and a good family. This one is filled with some wonderful moments, some beautiful animation, though while still realistically rendered, there is a stylistic bent to it as well. And of course, there are the songs – There’s the now classic Bella Notte, which is serenaded to Lady and Tramp while they dine on spaghetti, the wonderful, He’s a Tramp, and the Siamese Cat Song, which much like some of the dialogue coming out of the cat’s mouths, seems a touch racist in its delivery and style. Still, the film entertains, and I hadn’t seen this one since I was a child! It holds up very well, like all the best Disney films.